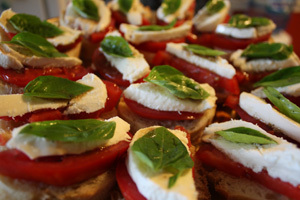 Bruschetta is a great appetizer to take to a party and I know I just can’t get enough of it. Zeb from Seducing Zeb – Book 4 of my Tarnished Saints Series, got in the habit of not only eating this but making it for himself. Matter of fact, he has two different ways to make it. Zeb, can you tell us how your love for bruschetta all started? Zeb: Elizabeth, I have to tell you that being one of twelve siblings, all boys, there were a lot of hands frantically grabbing food at the dinner table – every time my preacher father turned his back. But we were always hungry and had to fend for ourselves. Start out with a loaf of that long vienna bread and cut it into pieces. Now, you could toast it, but I prefer it just as it is. Mince some fresh garlic and spread it on the bread. Next, slice up tomatoes and lay them on top. 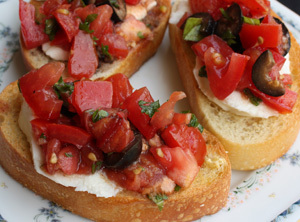 If you have fresh ones from your garden, it makes the tastiest bruschetta. Then take some fresh mozzarella cheese and slice that up and put it over the tomatoes. Sprinkle some balsamic vinaigrette dressing straight from the bottle (lazy man’s way) over the cheese and top off with a fresh leaf of basil. Loaf of Ciabatta Bread – Have the store slice it. Drizzle some Extra Virgin Olive Oil over the slices and spread a little Minced Garlic on top. Put them in the toaster oven just to brown them so they’ll have a crunch factor. Salt & Pepper – To taste. 6 Black Olives – chopped. Fresh Basil and Parsley – A handful of each. I use scissors to cut it up in small pieces. Mix all this up in a bowl and if you let it sit in the fridge for awhile it absorbs the flavors. 8 oz Fresh Mozzarella – sliced. Can’t wait to try the recepie it sounds great. Can’t wait to try it, sounds yummy!! Oh sorry, my WordPress name can up, this Ruth Miller.